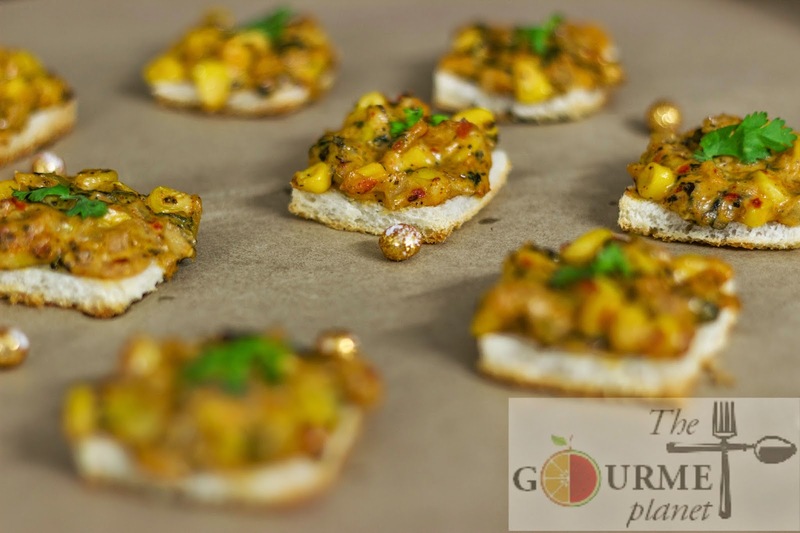 Culinary Delights from My Kitchen: Corn & Spinach Canapes...a burst of flavors! Morning rush at my house is crazy! Believe me that's the hour of the day when i am busiest and literally hopping from one area to another...Maddening it is! Hmm..guess by know you would have assumed that there would be kids around who create such a ruckus! ha ha ha..Trust me, there are just two of us in my home, my dearie husband and me...ofcourse! Still a havoc...is what you would be wondering now!!!??? Just lots of work, all of which i want to do by myself. I know, i know, i am bit finicky! So, my day starts early and is followed by a few rigorous rounds of Surya Namaskar & then i a peaceful meditation which completely de-stresses me. Aahh! Keeps me sane even in times of utter commotion. Once i am through with my exercise regime, my real work begins!..Phew! Prepare breakfast, get the lunch ready, pack the tiffins, get the house cleaned, see off my husband and finally leave for my work. Lunch is usually simple affair for which i do some basic preparations an evening before. But i dread breakfasts coz i am never able to think differently for this meal of the day, perhaps, the hectic schedule and my panic stricken state being the reason, which doesn't let me think beyond the regular stuff. 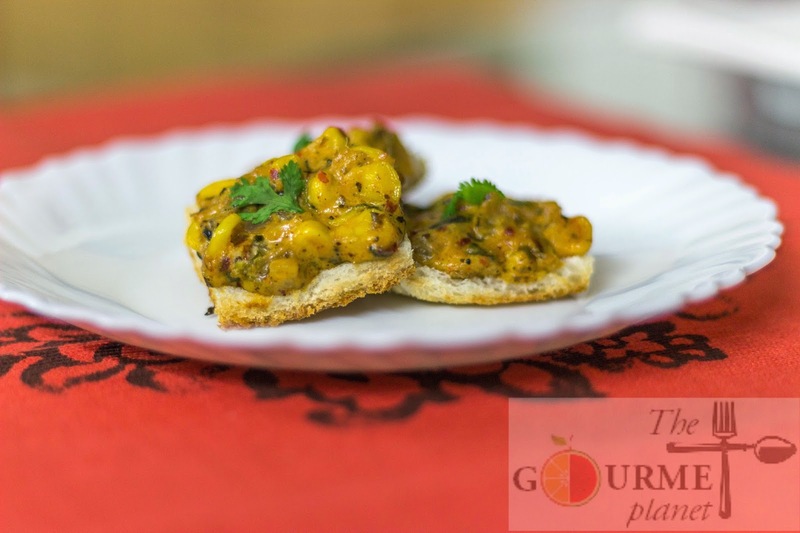 Poha, parathas, sabudana khichdi, chilla or cornflakes with a fruit bowl or sprouts are usual. Yet nothing exciting! My husband is an avid food enthusiast yet has never complained about mundane breakfasts served to him. Was it just a guilty wife's confession or my husband never really had any concerns. Well, i am absolutely clueless till date. Nevertheless, my take is on the former, so that i constantly aim for something new. Little did i know that today morning was the day of a miracle. I stumbled into some frozen corns and 6-7 slices of bread. Looked around in my fridge a bit further and caught hold of a pack of cream. Strange, but i knew all had been done. I just happen to utter to myself, 'Viola!! 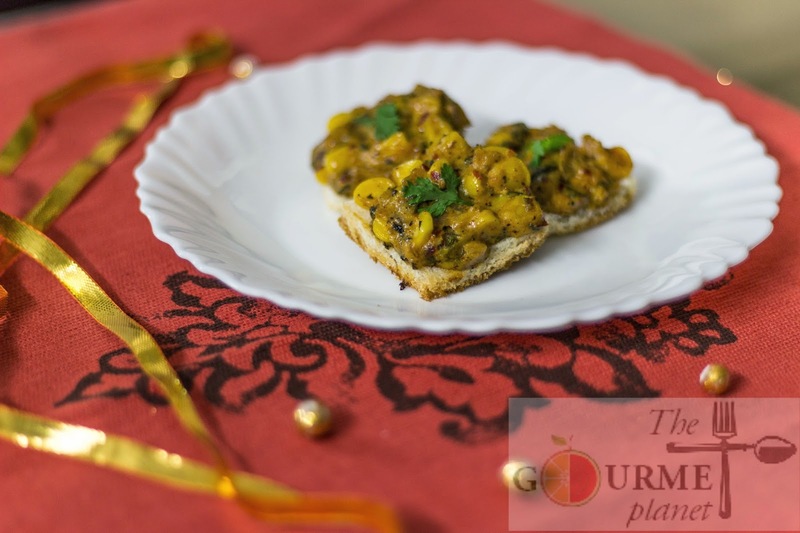 Wonderful, i'll try some corn canapes today' ..unaware of the recipe, just concocted by me a seconds ago, i was confident enough that i would be able to conquer a delicious experiment. So just followed my gut feeling & i nailed it! So if you feel to impress your some loved one, bang on, NOW is the time! Win all the hearts with this sumptuous creamy corny-spinachy dish. Moral of my story: Just follow your heart and you will succeed! 2. Once they are soft & supple, and strain them, ensuring all the water is drained. 6. Now add honey and give whisk one more time. 7. Cut the bread slices into squares with the help of a cookie cutter. NOTE: You could play around with the shape of the canapes. Instead of squares, you could simply remove the edges of the slice and cut into two triangles. That would work too or may be have roundels!! Just need to be creative! 8. Line an aluminium tray and brush it with slight oil. 9. Place the square shaped bread on the tray and now top mixture on the bread and spread it well. 9. Bake for 10-15 mins, till you see the crust browning. 1. You have to roast/grill the roundels only on one side. Do not flip them. 2. To check the doneness of the roundels, you may touch them and see if they appear crispy and crunchy. 3. When they are ready, arrange them on a platter and serve hot! Not necessarily with a dip coz its already spicy and sweet. 2. Heat a pan/tava/griddle on the gas stove and spread some butter and let it melt. 13. Ensure the flame is on medium else all will burn. 14. 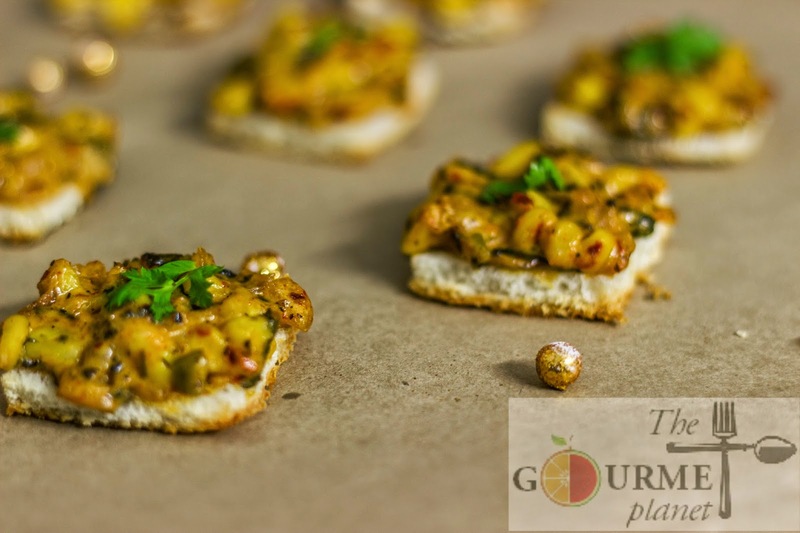 Let the canapes toast on the pan for a sometime while you regulate the flame from low to medium as needed. Corn is high in Vitamic C and Spinach has good amount of Iron, so this forms a sumptuous and indeed a wholesome and appetizing breakfast. You could accompany these yummy finger food with your choice of mocktail and you will be transported with pleasure! !